Below, you’ll see an interview with Isabella Muzzi whose work I photographed in the Garment District. She hired me to come in and shoot the last fitting of the muslin prototypes of her new jacket line. When I saw the selects I realized this was an alternative universe that many would never see. We look at garments and presume they are fully birthed from a sweat shop in the pacific. I had no idea how wrong I was. Isabella is on the verge of launching her debut line during NYFW 2019. She has risked everything to make it happen. “If it doesn’t work out, I’ll have a whole new wardrobe that cost me $30,000.00” she chuckled, albeit a bit darkly. Nevertheless, she is a huge talent. As a designer starting a new brand, this is being figured out as I go along. So much of it I have discovered through trial, error. My design background is very technical, so I know how a finely-tailored jacket should fit. I have constructed many by hand in the past, so I know how to instruct the sample makers to make corrections. Every last detail is taken into account, down to the sixteenth of an inch. That’s what separates a luxury garment from something at Forever 21.Seams are pinned by hand to accentuate the nuances of the human figure. Markings are made freehand with a Sharpie. It is in those details where the garment transcends the ordinary and becomes something impossibly unique. 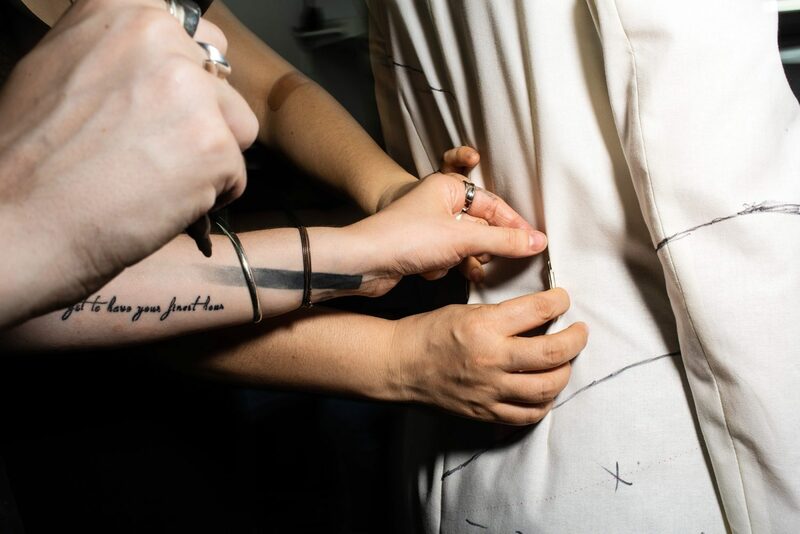 Hands of Isabella Muzzi and her tailor tug at a garment prototype. Garment District Fit Model side view during tailoring. 3/4 view. Garment district buildings in the distance.